Repêchage Opti-Firm Eye Contour Treatment is a professional treatment based on the latest advances in skincare and clinically proven ingredients that work to combat signs of sleep deprivation, aging, and environmental damage. Based on a combination of natural extracts of Gingko Biloba, Gotu Kola, and firming Seaweed with targeted Dipeptides(ant-inflammatory effect), Tetra peptides(regulates the cell cycle through up-regulation of telomerase activity) and enzyme stimulating Chrysin to help reduce the appearance of wrinkles, puffiness and dark circles. Eye Zone Care: An exclusive formula fortified with advanced marine proteins and peptides is massaged around all parts of the eye area. Helps increase skin firmness and helps to diminish the appearance of lines, wrinkles, dark circles and puffiness around the delicate eye area. 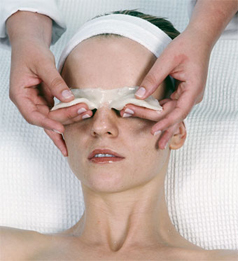 Translucent Sugar Mask: This mask is applied to the eye contour area to hydrate and firm skin. Lift Serum: Based on patented technology and advanced science, this serum utilizes a three-dimensional biopolymer from Pure Almond Protein, loaded with polyphenols and antioxidants that help build and repair the skin barrier. The three-dimensional biopolymer creates a net-like structure that instantly lifts out the appearance of lines and wrinkles for immediate, more dramatic results.